Stateville penitentiary in Illinois has housed some of Chicago's most infamous criminals and was proclaimed to be "the world's toughest prison" by Joseph Ragen, Stateville's powerful warden from 1936 to 1961. It shares with Attica, San Quentin, and Jackson the notoriety of being one of the maximum security prisons that has shaped the public's conception of imprisonment. 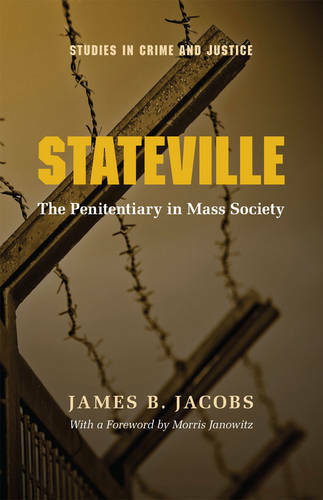 In Stateville James B. Jacobs, a sociologist and legal scholar, presents the first historical examination of a total prison organization-administrators, guards, prisoners, and special interest groups. Jacobs applies Edward Shils's interpretation of the dynamics of mass society in order to explain the dramatic events of the past quarter century that have permanently altered Stateville's structure. With the extension of civil rights to previously marginal groups such as racial minorities, the poor, and, ultimately, the incarcerated, prisons have moved from society's periphery toward its center. Accordingly Stateville's control mechanisms became less authoritarian and more legalistic and bureaucratic. As prisoners' rights increased, the preogatives of the staff were sharply curtailed. By the early 1970s the administration proved incapable of dealing with politicized gangs, proliferating interest groups, unionized guards, and interventionist courts. In addition to extensive archival research, Jacobs spent many months freely interacting with the prisoners, guards, and administrators at Stateville. His lucid presentation of Stateville's troubled history will provide fascinating reading for a wide audience of concerned readers.